The popularity of credit card is overgrowing for its convenient features. A person need not carry a vast amount of cash in your pocket. A credit card is even helpful when you run out of money. If you use a credit card wisely, you can get rewarding benefits. What if you lost the credit card? You need to block the card immediately before any person misuses it. Dialing the customer care number is the traditional way of blocking lost or damaged credit card. It will take a long time to get connected with the customer care executive. If you immediately want to block the credit card, you need a smart option. You can block HDFC Credit Card online. 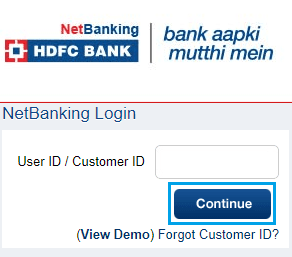 Step 1: To block the card online, you must activate HDFC Net Banking facility. Log in to the Net Banking account using your User ID and Password. Step 2: Drag the mouse cursor to the Cards tab and click on it. Step 3: Now select Enquire option under the credit card tab from the sidebar as shown in the image below. Step 4: Next click on Credit Card Hotlisting under the enquire tab. Step 4: The screen will display the list of credit cards registered with the account. Select the Credit Card number which you want to block. Make sure to provide the reason for hotlisting the credit card. If you lost the card, select the option to reissue a new one and click the submit button. You have to confirm the same details on next page and a reference number will be generated. Important Note: You will be charged Rs 100 as a fee for reissuing HDFC credit card. It will be reissued with 7-10 working Days. You will receive a notification containing confirmation of the request to block the credit card. You need not visit the branch to block the card or don't need to keep on trying the customer care number. You can easily block the card with net banking facility.